Satellite- and radio-tracking allowed the monitoring of a wild male Houbara Bustard in 1998 and 1999. Routine monitoring demonstrated that this wild male remained close to his display territory all year round. In addition, this male displayed at the same display site in successive springs, in years of greatly differing primary productivity. The display area covered approximately 2kmsq but a central core area was predominantly used. Most displays were of the typical circular running dance, but these were interspersed with straight runs in typical display posture, sometimes over a considerable distance. The frequency and duration of these displays differed between years and probably reflects a higher contact with females (minimum three individuals in 1998, none in 1999) and a greater primary productivity in 1998. 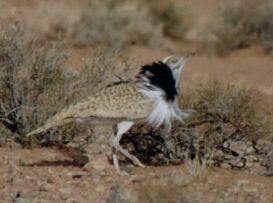 An important part of IFCDW research activities at the Desert Ecology Research Station (DERS) is study of remaining wild populations of Houbara Bustards. Knowledge of year-round movements is important for all aspects of protection of this species. In 1998 and 1999 we had an excellent opportunity to study one adult wild male on his display territory only 5km from the Station. This male was fitted with both a battery-powered satellite-transmitter and a conventional VHF radio-transmitter. Detailed monitoring of this bird was very important because the arena was situated well within the dispersal range of released Houbara Bustards. Thus, not only were his movements monitored, but also interactions with re-introduced birds were possible. The DERS is situated in a plateau between Goulmima and Errachidia in an elevation 1100 m (Peske 1998). This triangular area with east-west length about 60 km is limited on the north by the chain of High Atlas mountains and in the south by an escarpment about 150 m high. Generally it is a stony hammada eroded by a system of wadis, particularly towards its southern edge. In this undulating landscape there are wide shallow depressions surrounded by slightly elevated ranges of several km in width. Five km in south-east from the Station there is a slightly lower area and it was here that a wild male was discovered displaying in spring 1998. The male was discovered on 27th February in a site that proved subsequently to be at the periphery of his display ground. This area comprised a circle of approximately one kilometre in diameter that could easily be monitored from an elevated point using a telescope. He often displayed in the center of the circle or from an alternative position on the western edge of the area. He was also observed displaying at a number of points around the circle. During our initial observations in March we became more familiar with his behaviour. Early morning, from dawn, he was usually standing stiffly in the central part of the arena, on a very small promontory that was hardly recognisible in situ but visible from the horizon. The darker contoures of his head were normally all that was visible above the vegetation. As good light appeared, he would start the typical display dance. This dance, about twenty seconds long, was repeated every two and half minutes on average. However, the male rarely ran in clear circuits that ended in the same spot. His trajectory was unpredictable but in general, he would move gradually, mostly to the east. The familiar form of circular dance was usually interrupted by linear long runs with erected white plumage as in the true dance. The duration of these running phases was longer than in circular dances, sometimes he moved up to 1.5km in as many as six strait consecutive runs. After these long movements he remained standing immobile for about thirty minutes or even more. These long runs were more often in the second half of the morning display when brakes between dances also became longer. We do not have good evidence about afternoon displays in March, as the area was used by Bedouins and we could not find the male when he was far from the central arena. Generally, we assume that afternoon display activity was lower. The first observed intra-specific contact was on 2nd March, when he approached a single bird, probably female, on the edge of his arena. The second direct contact on 7th April was when he flew a few hundred meters to attack and push out another bird. On closer inspection this proved to be a female with two young chicks. From 17th February to 20th March and from 18th April to an unknown date, one our released female lived close to his territory and although we never observed any direct contact, we believe that he mated successfully with this female. After the observation of an aggressive approach towards a female with chicks an 7th April, we decided to use a dummy female incorporated an electric motor. We used a very simple combination of a head and neck from a dead Houbara Bustard, using black plastic eyes, two dry wings and cotton. After installation on the morning of 8th April, the male performing the typical dancing display, approached the dummy female and was caught in a spring trap with a frame with a 1m frame strung with netting. We transported him to the DERS where we recorded basic biometric data, took a sample of feathers, a sample of stomach parasites and attached the combination of satellite (30 g) and conventional (15 g) transmitters backpack style. After two hours the male was released in the same place where we caught him. He immediately flew to well behind the first horizon. The next morning we observed seven display runs in a twenty-minute period. Since then, we have recorded his presence at the area by daily monitoring of his conventional signal from the Tower. He displayed until the end of April and probably later, but observations were halted on 30th April. During April, the area became flooded by domestic stock and it was and it was difficult to monitor his natural behaviour except in the early morning. From April 1998 to April 1999 all accepted satellite locations of male were clustered in the vicinity of DERS indicating that the male did not abandon the arena and its surroundings. A detailed study of the home range in different parts of the year showed that the male preferred few small areas where he spent the whole summer and winter. In winter he spent a few weeks at the lower plateau to the south of the Station. All these sites were within 15 km from his arena in 1998. This bird was never located in the DERS enclosure. The male first returned to his display ground on 17th January, when he was seen walking without any signs of display activity. Over the next few days, he was observed feeding in an adjacent area towards the east and in the first half of February he was feeding in small wadis 7km to the north. It was not until the morning of 4th March that we saw him standing in the center of the display ground, but the full display run was not recorded until 28th March. The next display was observed on 12th April and in particular on 14th April, when both morning and evening display runs were recorded. After this date there was no further display activity in the spring. There was a market difference in display activity between 1998 (covered from February to May) and 1999, though the same display sites were favoured in both years. We did not record the presence of any other wild birds in 1999 and so an absence of females could be a limiting factor for the stimulation of display activity. However, a later start and a lower intensity of display were also observed from released males within the enclosure, were females were present. Thus, some other factor was also influencing male display patterns. After one year around the display ground the male disappeared on 28th April. From satellite locations, we can conclude that he spent from 4th May to 2nd June in the area south from Bouanane and/or in the Plains of Tamlelt. This is about 200 km from his usual home range. However, he had returned once more by 13th June and again was present here on 19th August. He had returned to his display grounds on 6th September and remarkably, from 9th September he was displaying once more with an intensity similar to that observed in spring 1998, with both morning and evening runs. Other wild and released males also displayed at this time, this behaviour following rains in late August and continuing into early November. Even this surprising discovery of breeding activity in the autumn was eclipsed by the discovery of a brood of two very young chicks near the Atlantic coast on 20th October, suggesting a clutch initiated in the last week of September. This was four weeks after unseasonal and heavy rainfall in August. We interpret this as a further demonstration of a previously unrecorded opportunistic breeding response by the Houbara Bustards. Year-round monitoring of this wild male confirmed high site fidelity to feeding and display areas. Relatively small movements of this individual were observed, primarily among clearly preferred areas. Between February 1998 and April 1999 he did not leave the area around the arena and used same arena for displays in two successive springs. However, after very late and reduced display activity in 1999, perhaps related to little of no contact with perspective mates and poor vegetation growth following an extended, cold, dry spring, he departed for an area about 200km eastwards, where he spent approximately one moth. In the following four months he visited his home range area at least twice and was observed performing a hitherto unrecorded autumn display that was of an intensity comparable to that in spring 1998. Peske L. (1998) Progress report from the release site at Errachidia. Pp. 44-49, In RJG Dawson and C Lindsay (Eds) IFCDW Annual Report 1997.